The basic pmmc instrument is sensitive to the temperature. The magnetic field strength and spring tension decrease with increase in temperature. The coil resistance increases with increase in the temperature. Thus pointer reads low for a given current. The meter tends to read low by approximately 0.2% per Celsius rise in the temperature. Hence the temperature compensation is provided by appropriate use of series and shunt resistance of copper and manganin. 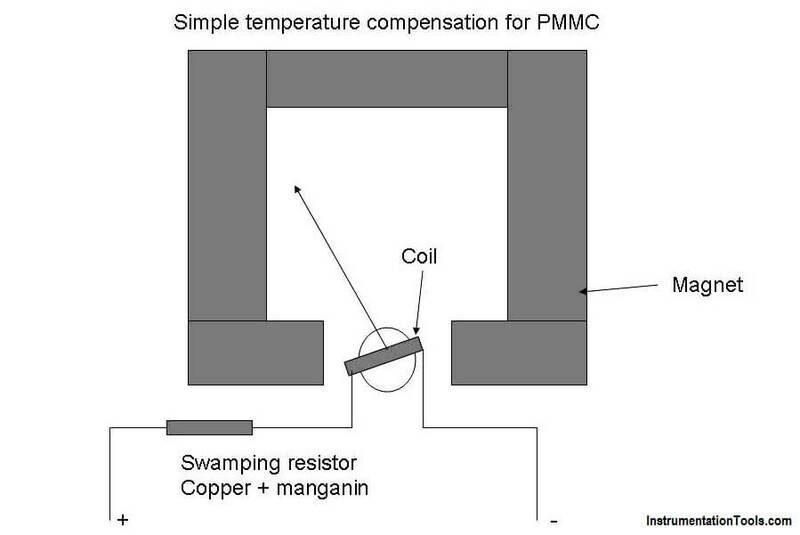 The simple temperature compensation circuit for PMMC uses a resistance in series with a movable coil, as shown in the figure. The resistor is called swamping resistor. It is made up of manganin having practically zero temperature coefficients, combined with copper in the ratio of 20/1 or 30/1. The resultant resistance of the coil and the swamping resistor increases slightly as temperature increases, just enough to compensate the change in springs and magnet due to temperature. Thus the effect of temperature is compensated. More complicated but complete cancellation of temperature effects can be obtained by using the swamping resistors in series and parallel combination as shown in figure. In this circuit, by correct proportioning of copper and manganin parts, complete cancellation of the temperature effects can be achieved. The basic sources of error in PMMC instruments are friction, temperature and aging of various parts. To reduce the frictional errors ratio of torque to weight is made very high. The most serious errors are produced by the heat generated or by changes in the temperature. This changes the resistance of the working coil, causing large errors. In case of voltmeters, a large series resistance of very low temperature coefficient is used. This reduces the temperature errors. The aging of permanent magnet and control springs also cause errors. Opposite errors in PMMC is caused by weakening of magnet and spring cause. The weakening of magnet causes less deflection while weakening of control springs cause large deflection, for a particular value of current. The proper use of material and pre-ageing during manufacturing can reduce the errors due to weakening of control springs.